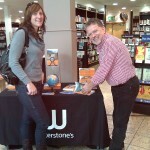 Saturday 15th October, Waterstone’s Finchley Road; our first ‘London’ gig. Walking down to the garage to get the bike the asphalt roof in our neighbour’s garden glistens with a light lick of ice. That and the slight whiff of decomposing leaf mulch indicating the first signs of winter approaching. I ride out into the beautiful crisp blue-sky morning for the 30 mile run down the A1 and into the city. As my eyes squint against the autumn sun, low in the sky, these cold bright mornings trigger other travel memories sending me mentally back to the Altiplano and high roads in the Andes as I feel the mild scorch of cool air on hot lungs. Setting up the bike in the bookstore provides further fantastic flashbacks of riding the bike straight through the front doors of the Hotel Residencia ‘El Viejo Covadonga’ in Rio Mayo, Argentina. Riding a bike through the welcoming doors of a hotel is great fun in a childish sort of way. It’s one of those things that you’re generally ‘not allowed to do’ back home yet it would be a common occurrence on the trip as kind hosts obligingly offered their reception / lobby for safe parking for the bikes. Riding through the open doors of a welcoming bookstore gives just the same buzz. It’s something naughty you ought not to be able to do, yet here we are doing it! Today has an added spice as I can’t get in through the front doors. Waterstone’s, Finchley Road is located inside the O2 Shopping Mall and the large rotating front doors were already in public use when I arrived so I clearly couldn’t gain access that way. James the manager sent me round the back of the centre to try the goods access. A large steel gate opened remotely to permit access to a line of deserted, dimly lit loading bays, you know the sort with a back-up area for trucks to a high concrete step so the goods can be rolled straight off the vehicle. I rode along the line, unable to see how I could get the bike up the steps, until right at the end I was met by James. This final loading bay had an ‘L’-shaped concrete ramp at one end of the step which ran up a steep incline of about 45°. Each leg of the ramp was only slightly longer than the bike so I couldn’t take it in a single run. I had nowhere to put my foot down if I stalled on the way up, only the opportunity to fall from a fairly great height with the bike crashing down on top of me. Another flashback rapidly formed, this time of the scary ferry at Tiquina up on Lake Titicaca in Peru, the one that had us both screaming all the way across and my mouth filled instantly with the metal mouthwash of adrenaline. Action prevailed over thought and I took the ramp in two; riding up the first leg, then letting the rear of the bike slide down whilst I re-positioned the front for the final assault to the top. A small reward awaited in the form of another motorcycling first when I got to ride the bike into a large stainless-steel elevator, which took us without further incident up into the store. The ultimate reward for both of us at all of these events is the great people we get to meet and today was no exception. Our first customer was a lady called Christine, originally from Jordanstown back home in Northern Ireland. She had been sent to boarding school in England and lived most of her seventy odd years in London. Christine had travelled a bit herself and fully understood the lure of the world seen from the saddle (her most recent mount had been a BMW C1 scooter, the one with the roof). She had beautiful blue eyes that sparkled with life and a smile to match whether she was listening to our tall tales from the road or responding with stories of her own. Fast forward now to the end the gig with tired feet from standing all day and a sore jaw from nattering when two of the most beautiful women I ever laid eyes on accepted a book-mark from me, our standard means of introduction, in the store. I ran through my spiel on the books and the bike, explaining in a few sentences how we had come to be here. I had no problem engaging these delightful Saudi princesses (for surely they were) who immediately set on interrogating me into the why’s and wherefore’s of the trip. This time I was caught in the cross-fire of two pairs of flashing dark-brown eyes, come fully to life, with more beautiful laughs and smiles as they walked off with a set of our books for one of their husbands.